Along with Berenice Abbott and Weegee, Lisette Model became a photographer of New York. The city–the place became very important to Model–even her portraits are uniquely anchored to place. Ann Thomas was drawn into the Model orbit when she had to prepare documentation on Model to support the acquisition of twenty-nine Model prints in 1985 and 1986 at the National Gallery in Ottawa. Her book seems very thorough and her documentation seems to include many sources beyond the obvious and well known Model circle. (I write “seems” because I have heard rumors that some of Model’s former students have made lists of errors, but I didn’t detect anything egregious. There quest probably says more about the intense feelings that Model evoked as a teacher than it does about Thomas as a scholar.) I’m grateful to Thomas for quoting from many unpublished or narrowly circulated Model interviews and for publishing many unfamiliar images. 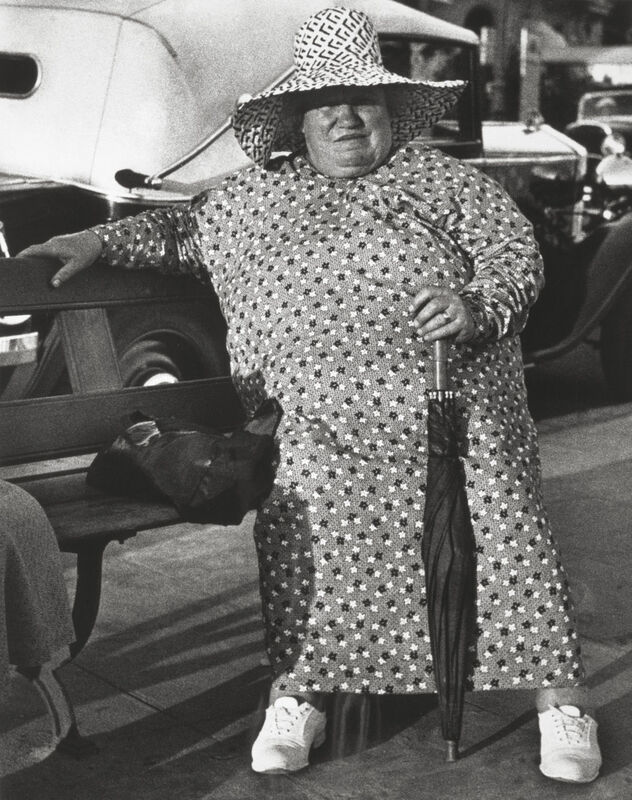 Hers is probably the only major book that will be devoted to Lisette Model and her work–and the photographer is well served by Thomas’s effort. (Interestingly, there are no thesis listed in the bibliography. 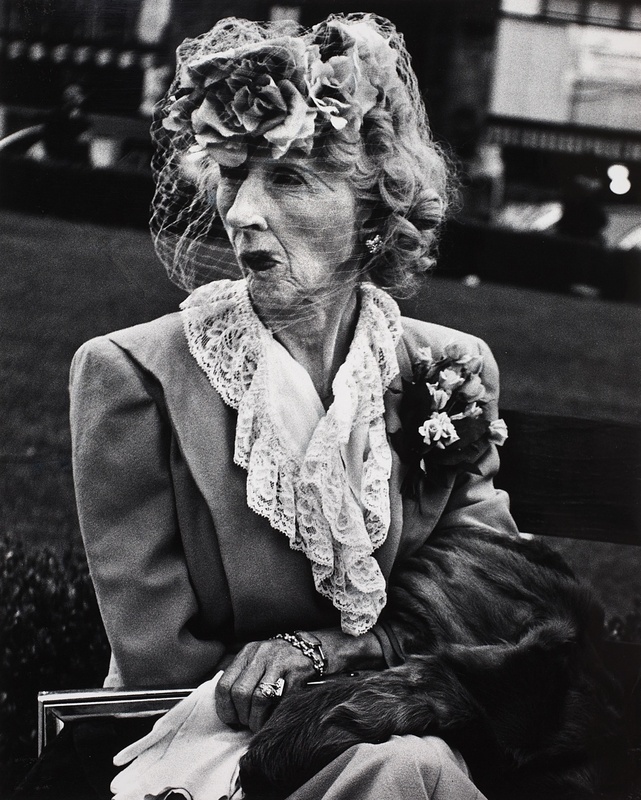 Is it possible that nobody has written a thesis on Lisette Model yet?) The volume is a must on any photography bookshelf and necessary reading for anyone interested in the careers of women artists. Thomas’s book serves as the catalogue for the Model retrospective she organized and which is travelling to several cities here and abroad. The text is divided into ten chapters which describe the Vienna into which Model was born, the Paris to which she fled, the New York to which she emigrated and the various bodies of work she created. The heart of the book is in the two hundred plus working and final images by Model( 150 of which are portraits ) and in the chapter describing Model THE TEACHER and particularly, her relationship with her most successful student Diane Arbus. Thomas has included reproductions of work by Eugene Atget, Andre Kertesz, Otto Dix, Egon Schiele, Weegee and others to put her work in a historical context. During Model’s life, whenever a biography was begun, even based on information she herself had provided, some shadow always fell, usually shortly after the initiation of the project. Model is best known as a remarkable portrait photographer who emigrated to this country at the beginning of World War II AND as the teacher and friend of Diane Arbus. Although her work is included in EVERY history of photography and was included in every important exhibit during her lifetime, it is as a teacher that Lisette Model was revered. Charismatic and reeking of Vienna and Paris culture, direct and secretive at the same time, Model fueled her legend all the while she disputed its existence. Thomas approaches Model with a clear head. 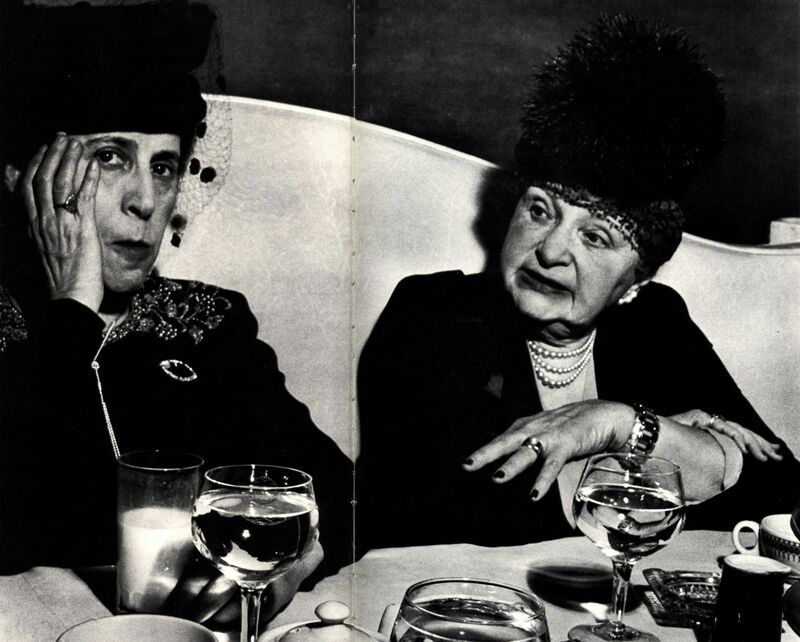 p.l5 Lisette Model was, to a large extent, her own creation. In over eighty years of life she changed the recounting of her history as she saw fit, constructing a self-made narrative impossible to separate from her work. Few have controlled as fiercely the documenting of their histories. During Model’s life, whenever a biography was begun, even based on information she herself had provided, some shadow always fell, usually shortly after the initiation of the project. Her seemingly curious habit of first talking freely about her life, and then denying her words or refusing to permit publication resulted in collapsed projects, censored writings, and severed friendships. Model’s sister Olga was born when Lisette was 8. Her father, who was subject to depressions, died of cancer in l924, long after much of the family fortune had been diminished in the first world war. Brought up to be a musician, Model studied with Schonberg when she was l9. It was to study voice with Marya Freund, the Polish soprano that she left Vienna in 1926 for Paris. Her mother and Olga moved to France as well, but to Nice. Visiting her mother in Nice in 1934 Model took her camera out on the Promenade des Anglais and made a series of portraits which to this day are among her most widely reproduced and widely exhibited images. With them Model declared her trademark style: Close-up, biting, satirical–almost like photographic political cartoons. Visiting her mother in Nice in 1934 Model took her camera out on the Promenade des Anglais and made a series of portraits which to this day are among her most widely reproduced and widely exhibited images. With them Model declared her trademark style: Close-up, biting, satirical–almost like photographic political cartoons. In a nice bit of art history sleuthing, Thomas discovered that this series was published in the communist periodical Regards, a publication led by Ehrenburg, Gide, Gorky and Malreaux in 1935. Model, she says, never denied having published her work in Europe, but neither did she ever precisely acknowledge having done so. p.50 Thomas also relates Model’s style to the style of images published in Regards and what was being shown in small galleries—that approach, almost mocking, surely exposing, with the photographer or artist clearly separate/different if not superior from the subject–was in the air. Model perfected it, but she didn’t invent it. Thomas reproduces ten of the Promenade des Anglais portraits. In what is one of the most interesting aspects of her book, she also reproduces a few of Model’s images from the series. That means they are exactly as Model took them in the camera and before she cropped them and enlarged them to make them how she wanted them to be. Thus we can try to figure out what was in Model’s mind when she snapped the shutter and we can see what she really wanted to emphasize. (Many photographers consider the negative frame to be sacrosanct and they only print their images full frame.) An interesting implication of Model’s cropping of images is that the subject appears closer to the photographer than was actually the case when the photographer snapped the shutter. In Model’s final image there is an overwhelming feeling of confrontation, of crowded elevator closeness. In reality, in many cases, model was probably six feet away. Model married the Russian Jewish artist, Evsa Model in l937. In l938 she and Evsa were able to emigrate to the United States where Evsa’s sister lived in Manhattan. Once in New York, Model tried to support herself as a photographer. As now, it was very very difficult. Though the proceeds were meager, by any standard she was successful for fourteen years. Her photographs appeared with frequency in Harpers Bazaar and she was highly regarded (if not difficult to deal with) by the editors Carmel Snow and Alexey Brodovitch. Her work was purchased by the Museum of Modern Art and was regularly exhibited there. 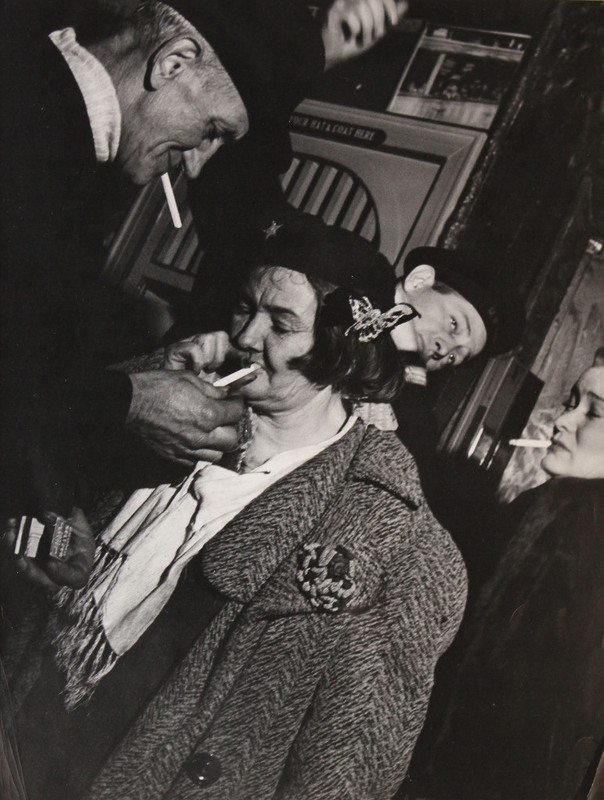 Along with Berenice Abbott and Weegee, Lisette Model became a photographer of New York. The city–the place became very important to Model–even her portraits are uniquely anchored to place. As a newcomer to Manhattan and to America (did she have to learn English? ), Model began to photograph on the lower east side and in a small bistro called “Sammy’s. Probably influenced by the work of Eugene Atget whose work she would have seen at Berenice Abbott’s, she began to point her camera toward shop windows and their reflections. And somehow she got the idea to crouch on the sidewalk or sit on the curb to photograph people’s legs as they walked by her on the crowded streets. Thomas reprints twenty-two images from the “Running Legs” series and twnety-five from “Reflections” series. The images are lyrical and almost gentle –there is none of the bite of the portraits. It is hard to believe all these images come from the same sensibility. Thomas has, in fact, chosen “Running Legs, Fifth Avenue” for the cover of her book. Since Model’s portraits are instantly recognizeable and well known (useful in marketing this book), perhaps Thomas is trying to direct our attention to this other side of Lisette. Thomas reprints several photographs that Model never printed herself. Presumably she didn’t notice them on her contact sheets or she didn’t like them or she never got around to printing them. Several are fabulous and one wonders what Model would have done to them. Having immersed myself in this volume,l I found myself trying to crop them with Lisette’s eye. A few, I decided, she may never have printed because she couldn’t crop them. They were elegant and perfect the way they were. In 1951 when the market for her photographs began to dry up, Model was asked to teach at the New School for Social Research. Her long-time friend Berenice Abbott already taught there. (Unfortunaltely, Thomas doesn’t get into the relationship between Model and Abbott/ McCausland, even though she dedicates the book to these two women among others. Did their friendship go back to Paris before Abbott left for New York in 1927?) By 1957, when Diane Arbus came to her class she was well known as an inspiring and tough teacher. The section of this book on the relationship between Model and Arbus is fascinating, more for what it doesn’t say than for what it says. There they were, Model about twenty years older than Arbus–two women of Jewish background if not religion, brought up in excessive privelege but now scrambling for work to support themselves and their families. There must have been other affinities, because they became very close. Since it is well known in photography circles that the Arbus estate won’t let any of Arbus’s images be reproduced without its approval of the accompanying text (and Thomas reproduces six Arbus images) it is hard to treat Thomas’s rendition of events impartially. Sometimes, I think Thomas very naive.p.l46 “According to her husband, Allan Arbus, …after three sessions with Model she had become a photographer. “There was no more hemming and hawing.” It was “as if she was ready to be a photographer and just needed a release–Model provided that release.” This would seem to reflect Model’s assessment of her role in the development of Arbus’s photography. She attempted to put distance between her own subject matter and that of her student, and she was emphatic about the independent nature of Arbus’s vision, insisting that she never showed the younger photographer her work, and that what she might have seen on her own was limited. Model came first and was the teacher. Arbus was a diligent student and she clearly absorbed Model’s approach and attitudes toward her work. I think it is an argument that can be shot full of holes. Model came first and was the teacher. Arbus was a diligent student and she clearly absorbed Model’s approach and attitudes toward her work. More specifically, she was drawn to the same or at the least very similar subject matter in her portraits. (In fact, I don’t think Arbus lived long enough to stake out her own territory in portraiture. Her world was basically the world she was led to by Model). One could make a case that since Arbus didn’t crop her images and had to be at a certain closeness to her subjects, she related to her subjects in a more intimate way than Model did to hers. Did the student supercede the teacher? Arbus’s reputation is inflated so to speak by her suicide and the shadow that casts still on the interpretation of her work–especially her last series of portraits on the grounds of a mental hospital. Did the student supercede the teacher? Arbus’s reputation is inflated so to speak by her suicide and the shadow that casts still on the interpretation of her work–especially her last series of portraits on the grounds of a mental hospital. But what is more interesting than a sports mentality evaluation of bodies of work is the question of their relationship–the mentoring, the love, the competition. Since we will never know the facts of their relationship, it will be left to novelists and film makers to amplify on it. Thomas writes with sympathy for Model, p.150: To see Arbus’s photographs grow out of, depart from, and in the end, eclipse her own could not have been easy for Model…On more than one occasion Model made public her regard for Arbus as a student and as a photographer, noting the quality of her imagery and the degree of her commitment. On the other hand, she sometimes made statements which sound negative or amibivalent, for example, when she alluded in interviews to Arbus’s work as being pathological or neurotic. These contradictory statements seem, finally, to be an expression of Model’s vulnerability and confusion about how their careers meshed, and where they separated. They have to be considered in the light of a strong personal friendship, an extraordinary teacher-student relationship, and the difficult circumstances of Model’s life, both professionally and financially, in the period after she met the younger woman. Model didn’t try to get assignments from publishers. She put aside her portraits of jazz musicians. (Her portrait of Billie Holliday in her casket is unforgettable.) Something exhausted her. It might have been the declining health of her husband. Or perhaps she had finally absorbed his negative and passive attitudes toward his own career as a painter? (Thomas doesn’t go into much detail about Evsa Model’s influence on Model or about their marriage. By all accounts, they were very devoted and very close .) Or maybe she got worn down by the hustling that was necessary to get work into magazines? Or perhaps she didn’t have the money for materials? Or maybe it was just the natural cycle of her creativity. Her friend Berenice Abbott’s work came to a sort of conclusion with her images of physics phenomena in l962, just five years later. (Only Imogene Cunningham was still photographing and producing books after she turned ninety.) Maybe teaching and her intense mentoring relationships with her students took all her psychic energy? In l966 Thomas reports that Model had uterine cancer, from which she recovered. Thomas doesn’t mention whether as part of her recovery she had a histerectomy, but if she did, perhaps that effected her energy for printing her own work. Whatever the reasons, it is hard to believe that the l960s and l970s in San Francisco (where she visited in l968) and New York (where she lived in the Village) didn’t inspire Lisette Model to run to her camera. The streets were filled with her kind of people. One final note: it is ironic and symptomatic of the state of our public and private institutions that the archive of this most American, most New York photographer, has ended up in Canada. Where was the New York Public Library? Where was the New School? Where was Princeton? 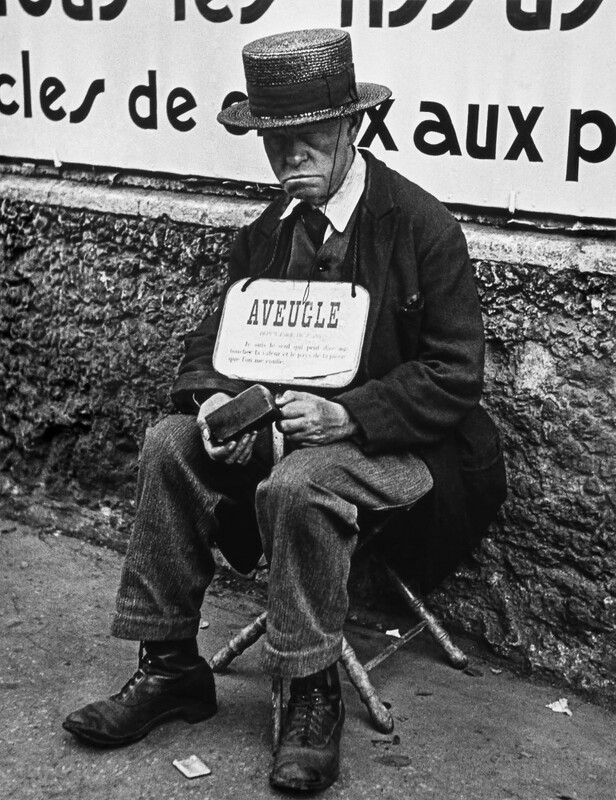 Posted in Essays, Street Photography and tagged Ann Thomas, Canada, Diane Arbus, Essay, Lisette Model, National Gallery of Canada, Portrait, Street Photography, The New York School.